Whether you are taking a Thrive art lesson or having an impromptu art extravaganza at the kitchen counter, here are three things to keep in mind to make it stress free and maximize the fun. Set the scene. Have you ever tried to focus on something and the tv was blaring, or there was a mess everywhere? It’s not easy. Same goes with art. 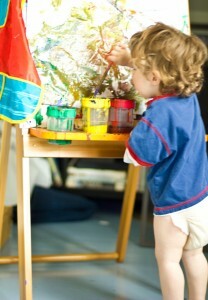 Provide your child with a peaceful semi-organized setting for their art making activity. Soft music without lyrics is a great way to set the tone. Be prepared. Have the materials out and ready at arms-reach before beginning. Most important supply- paper towels! I learned this the hard way when my 2 year old walked through paint spilled on the floor and continued to run across the carpet as I chased his colorful little footprints down the hall. Don’t meddle. Often kids don’t have a subject in mind when they are making art. They are fully present experiencing and experimenting with materials and the best thing we can do is allow them to take their inspiration in whatever direction they want. I often have to bite my tongue and observe rather than suggest. What tips do you have for making art at home? This entry was posted in Art at Home, Creative Process, Creativity by admin. Bookmark the permalink.